There's definitely a war of words going on around 4G here at CES. T-Mobile just said that will increase its top download speeds to 42 megabits per second from its present 21 mbps download speeds. I've gotten over the fact that T-Mobile's definition of a 4G network is far from that of the official standards body for mobile broadband technology, the IEEE. But it should be pointed out that T-Mobiles 21 and 42 mbps top speeds are theoretical and not really possible in the real world. When I asked the T-Mobile execs to get specific about the real speeds consumers should expect from the new 42 mbps HSPA+ service, they said that download speeds should be around 29-30 mbps and upload speeds should be around 5 mbps. Our tests of the current "21 mbps" T-Mobile service in San Francisco found some fairly fast download speeds-in the 6-8 mbps range--in various areas of town. But the coverage was spotty. In many of the neighborhoods we tested in we found download speeds of less than 1 mbps. T-Mobile was indeed getting some fast speeds during its press conference demos here in Vegas, but I'm not sure I could get those speeds a few blocks from the convention center. T-Mobile also took some time to talk a little smack about Verizon's LTE network. They make the point that while Verizon's LTE speeds are impressive right now, the network has no data-hungry devices like smartphones and mobile hotspots connected to it. Once these begin connecting to the Verizon network, the connection speeds may decrease. Verizon's CTO Tony Malone fired back a little with this remark: "We have kept our promise, not through ad agency and ad complains but with real performance." Malone is referring to T-Mobile's massive ad campaign around what T-Mobile calls its 4G network and phones. 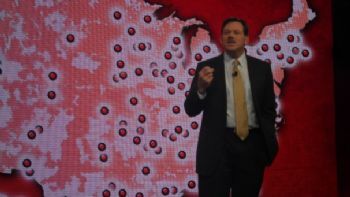 He suggests that Verizon has done more than talk; he says that Verizon's projected LTE network speeds have been proven-and then some--in the marketplace so far. "We expected some early speed bumps with our launch, but they have been few and far between." Malone said.